The Greeks - Who was Homer? 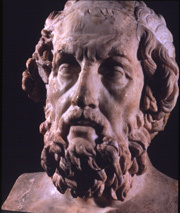 Nothing is known of the life of Homer, but as author of two of ancient Greece's most important literary works - the Iliad and the Odyssey - his importance to Greek culture can hardly be underestimated. "Seven wealthy towns contend for Homer dead,Through which the living Homer begged his bread?" Homer's verses were first set down in writing around 700 BC, soon after the Greeks invented their own alphabet by incorporating vowels into the existing Phoenician alphabet. The verses were probably significantly older than this, because we know that until this point they had been memorized by travelling bards who earned a living by reciting them.